It’s been 18 years since the first TELUS Skins Game hit Ontario in 1993. Even in its first year, the event attracted the best of the best — Jack Nicklaus, Nick Price, Ray Floyd and Freddie Couples. 18 years later, some of the names may have changed, but what hasn’t changed is the calibre of professionals who annually flock to Canada to play two pro-ams and a two day charity event. This all after one of the toughest weeks of US Open competition in recent memory. Ian Poulter, being kind to the USGA, called it, “a very difficult test of golf and stressful week”. This year Freddie made his 11th appearance; Mike Weir, his 8th and Retief Goosen, Camilo Villegas and Ian Poulter returned for their 2nd. What makes them come back every year after being beaten up at the US Open? Why don’t they just go home and lick their wounds? Some more jaded individuals might think it’s the pampering they receive from the sponsors or the lofty appearance fees they allegedly receive. But for golf lovers like me and the thousands of other fans who attend this event year after year, from the Yukon to Labrador, we believe that these golf guys love playing golf in the Great White North for all the right reasons. Why else would 4 out of the 5 players this week have already committed to playing the Canadian Open this year? It certainly can’t be the weather, with last year’s Open forced into a Monday final with torrential rains. Even on the first day of summer at Bear Mountain, temperatures never reached above 16 degrees. So when asked in the media tent after their first day why they keep coming back, it was no surprise to this writer that their answers were unanimous – it’s the quality of the event, what it does for local charities, the quality of the venues they get to play, and what really blows them away — the quality of the fans who support this tournament year after year. “I’ve played umpteen times and this tournament amazes me every year,” said Couples. 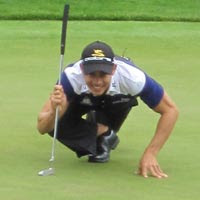 And after being cajoled by the crowd around the 9th green to show off his signature Spiderman poise, Camilo Villegas couldn’t help but agree that Canadian fans are a unique breed. Meanwhile Retief, who lead with 5 skins and $75,000 after 9 holes, couldn’t say enough about the quality of the Bear Mountain layout. This is the 5th time the TELUS Skins Game has been held in BC. Whistler’s Nicklaus North hosted the event in 1997 and 2005. Predator Ridge in Vernon welcomed it in 2000 and 2008. And although no announcements have been made about where the next Skins will be played, look for it most likely to be on the east coast post-Bethesda next year. And after the US Open at the Olympic Club near San Francisco in 2012, the obvious choice would be Predator Ridge’s newest 18 hole masterpiece, The Predator, that just opened for tee times on April 15th. ps: For those of you expecting a Big Break posting, check back with me later this week!